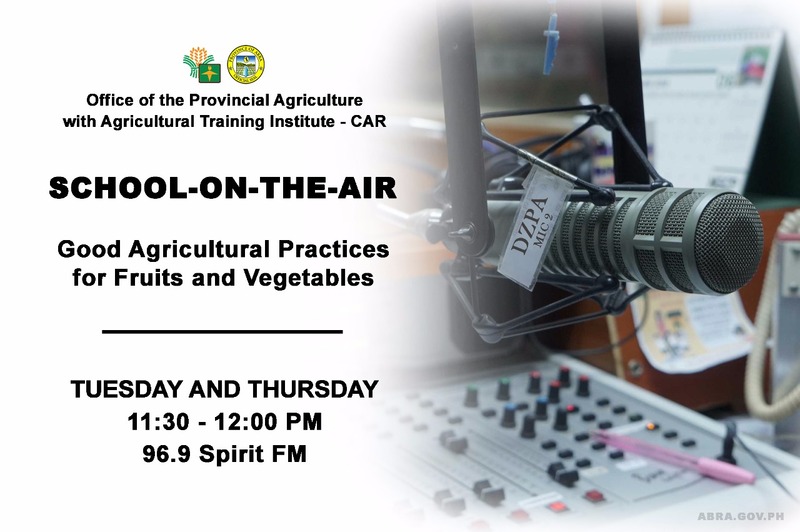 Office of the Provincial Agriculture (OPAg) in partnership with Agricultural Training Institute-CAR (ATI-CAR) carry out a School-on-the-Air (SOA) program on Good Agricultural Practices for Fruits and Vegetables (GAP-FV). School-on-the-Air program is one of ATI’s distance learning package of Good Agricultural Practices for Fruits and Vegetables. It is a series of lessons aired in a radio program for not less than 3 months. SOA aims to educate Abreño farmers through media, which will hopefully lead to food safety and product quality. Currently, GAP-FV School-on-the-Air has 1,514 farmer enrollees provincewide. Quizzes are given after every lesson or sets of lessons. The enrollees will also have a written final exam in August 2018 at the OPAg-Abra Multipurpose Hall. A graduation ceremony will commence at the end of the course to formally certify the enrollees who have met the course requirements. The program airs every Tuesday and Thursday at 11:30am-12pm on DZPA FM radio station.